Map of England and Wales. 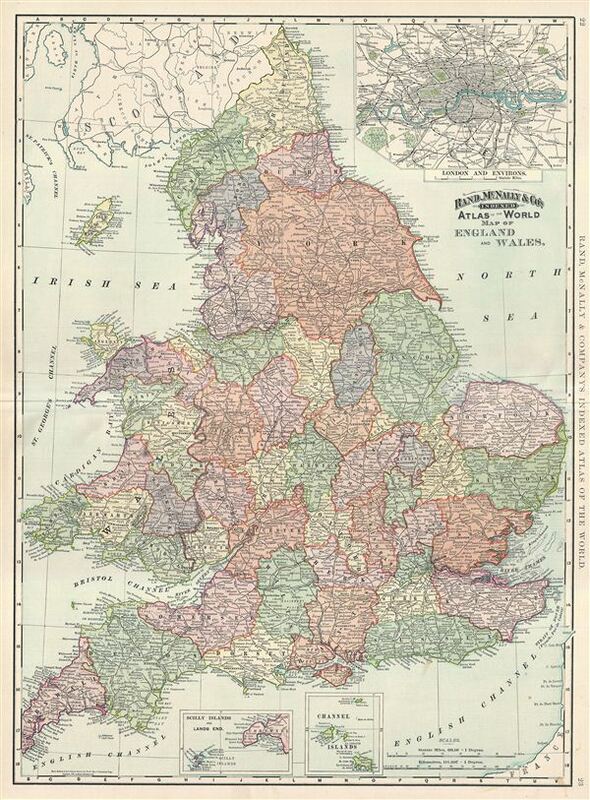 This is a beautiful example of Rand McNally and Company's 1892 map of England and Wales. The map covers both England and Wales in full from Scotland south to the English Channel, and from St. George's Channel to the mouth of the Thames River, including the Isle of Man. Two insets near the bottom margin feature the Scilly Islands and Lands' End and the Channel Islands. Another inset in the top right quadrant details London. Color coded according to regions and territories, the map notes several towns, cities, rivers, railroads and various other topographical details with relief shown by hachure. This map was issued as plate nos. 430 and 431 in the 1893 issue of Rand McNally and Company's Indexed Atlas of the World - possibly the finest atlas Rand McNally ever issued. Rumsey 3565.007 (1897 edition). Philip (atlases) 1026 (1898 edition).